A four-page spread on me and my work. April-May 2013. The Art of the Hexagon. July 23, 2012. 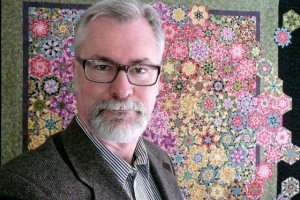 Architect and web designer Bruce Seeds finds expression in art quilts by Elaine Kollaja. Episode 54 - "Conversing with the Hexagons." A 37-minute Skype chat with Jeremy Fuksa about my work process and motivation. Episode 2502, aired in local PBS markets throughout the USA between August 2011 and August 2013. Watch my chat with Nancy here. January 12, 2011. Men Break the Quilting Pattern by Lonnie Turner. March 2010. Sewing Seeds by Nan Bialek. Photo by Dan Bishop. March 15, 2010. Live morning television. Milwaukee, Wisconsin. Interview by Nicole Koglin.